I have never heard of anyone who knows how to handle personalities and egos like Phil Jackson. He is one of the best examples of leadership that I have ever seen. How can anyone be a leader to NBA legends like MJ, Dennis Rodman, or Shaq & Kobe? As a NBA fan and a student of life, this book is very inspiring to me. Dialing back, one’s ego is crucial in leading other egos. Unlike most leaders that have control issues, Jackson learned to distribute power yet maintain final authority. He led without forcing his will on people. He chose to motivate and challenge them instead. When Jackson became the head coach of the Chicago Bulls, he had an established superstar in Michael Jordan as one of his players. What Jackson was able to do was state what he wanted to Jordan by making him think. Jackson challenged Jordan. He treated him like a partner rather than a subordinate. Scottie Pippen was a different personality and a different skillset than Jordan. Phil Jackson was aware that Scottie played point guard in college and played more like Magic Johnson than Jordan. So, Jackson created a position for Scottie “point forward.” Putting Scottie at point guard gave him a leadership role which also helped the team because Scottie was the leader that the players came to for guidance. Jordan was the tough leader that they feared. Without yelling or insulting. Phil Jackson new how to get through to his superstar. Phil Jackson was able to point out mistakes to players and have them identify that they’ve done wrong. When Dennis Rodman joined the bulls, Jackson saw beyond his antics. He saw the generous heart and the work ethic within Rodman. Instead of losing his temper when Rodman was late or kept his jewelry on at practice, Jackson would give him a silly fine or joke about how Rodman looked. Jackson showed Rodman that he was not interested in his rebellions and the problem disappeared. When other coaches treated Rodman like a child, Jackson was able to relate to him and also hold him accountable for his actions just like everyone else on the team. 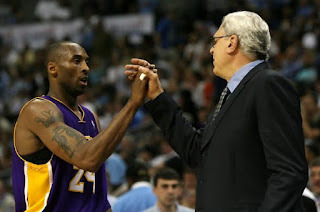 While most coaches come to a new team with an intent to impose their dominance over their players, Phil Jackson came to the Los Angeles Lakers, the players could see that he came in observing them, seeing how they handled stress, and never panicked or overanalyzed. Being a great leader is not bossing people around or being popular. Phil Jackson showed that leadership is letting your people bloom and grow without being forced to bend to his will. Everyone reacts and responds differently and Jackson was able to observe his players and deal with each ego and personality. Jackson taught his players to stay focused on the task at hand rather than dwelling on the past or worrying about the future. I have been around too many superiors that only care about promotions, status, and power. It’s hard to find leaders like Phil Jackson.